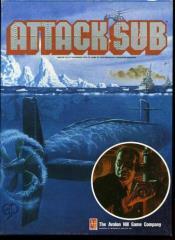 Attack Sub is a card-based war game of modern submarine warfare with US/Nato vs. Soviet/Warsaw Pact and Falklands War scenarios. Each player plays cards to increase their "contact level," which represents relative position to the opponent and sonar readings. When high enough contact level is reached, torpedos can be fired.